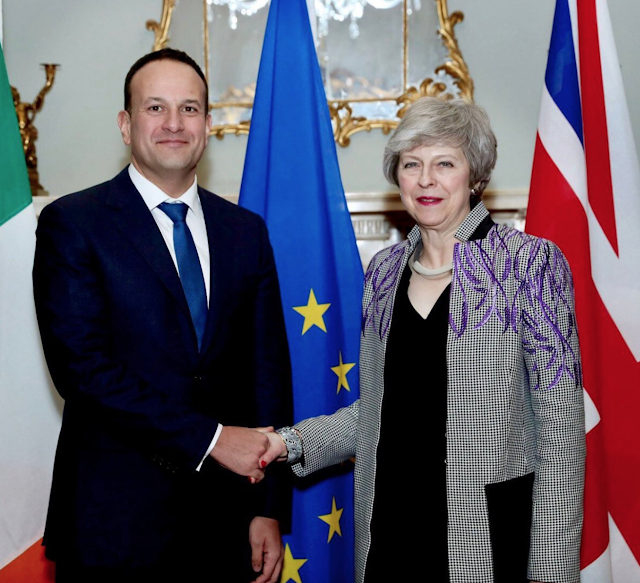 Theresa May debuted a new Amanda Wakeley coat on her trip to Dublin last week - and it was something a little different from what we have come to expect from the Prime Minister. The embroidered dogtooth check Crombie is new to the Wakeley range, and is part of the Spring/Summer 2019 collection. The purple floral embroidered detail on the shoulder is particularly striking, and May paired her coat with a simple black jersey dress and black kitten heels. The collection has other pieces that complement the coat- including a pair of dogtooth trousers and a matching skirt. It's certainly a statement piece! In an environment where image is everything, what a politician says, does and wears, often makes the headlines. As a blog that focuses and features 'political style,' my eye is always trained to the subtle (or not so subtle) messaging that a politician might be sharing with what they wear. Are they looking to reinforce a particular policy point or pay homage to the city they are visiting? Or perhaps they even want to cause a little outrage with a jacket or a bag. Fashion is often called frivolous, but the sartorial selections of our leaders can cause a real impact for the designers, brands and artisans who make creating clothes and accessories their life's work. 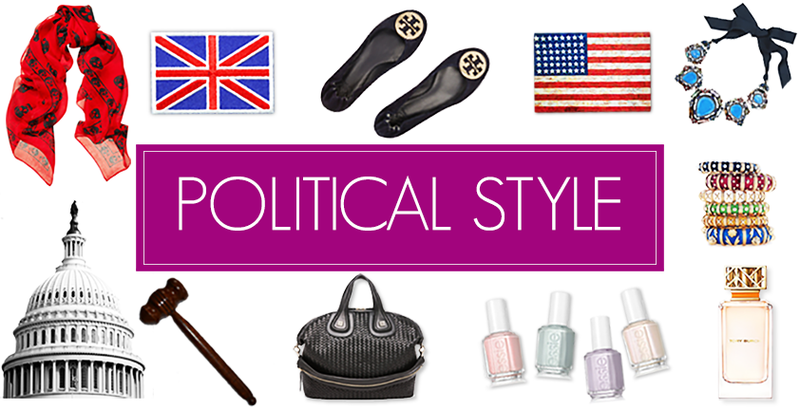 From Theresa May to Michelle Obama, here's how to dress with a message. Bold and bright, Theresa May's purple skirt suit is one of our favourites. Handmade by Daniel Blake, the Origami jacket with matching skirt is one that outfit that conveys the PM's strength and power. The poppin' purple hue reminds me of one of the colours in the suffragette palette, including the Votes for Women scarf that hangs in Parliament. 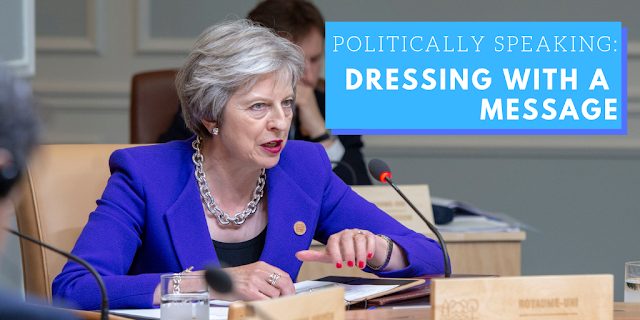 May will often wear this at the dispatch box, giving proceedings a twist of chic and colour. We have seen this look paired with the Kitty velvet kitten heels from Charlotte Olympia, and the oversized Amanda Wakeley chain necklace and bracelet. It's a truly epic look. May has several tailored items from Daniel Blake in her wardrobe. A uniform that every political woman should aspire too. Tuning into this year's State of the Union address, you couldn't help but notice a sea of white pantsuits worn by female members of the Democratic caucus. Echoing the message of suffragette's, female members of Congress donned white outfits to send a message to the President- and the viewing public of their refusal to be left out of the administration's policy priorities. Newly elected Congresswoman Alexandra Ocasio-Cortez wore a white cape, and returned House Speaker Nancy Pelosi cleverly accessorised her white pantsuit with a red and blue chunky necklace - the colours echoing the American flag. This is not the first time we have seen female lawmakers don white to make a political point. From using white to support the ERA to Hillary Clinton wearing a sharp white pantsuit to accept the Democratic nomination for President, here's a run down of its historical significance. 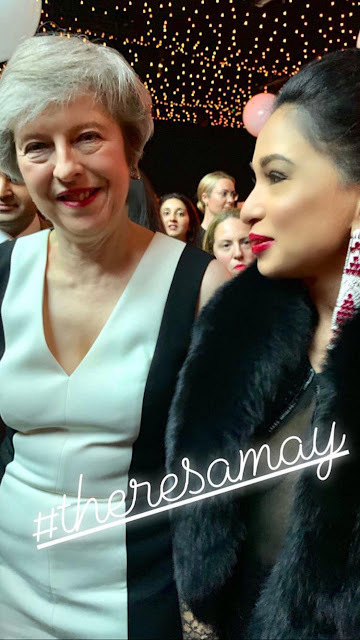 On her first visit to the UK as New Zealand's Prime Minister, Adern attended CHOGM and a dinner at Buckingham Palace wearing a traditional Maori cloak. Praised as a proud moment for women and Maoris, Adern wore a Kahu huruhuru; a Māori cloak adorned with feathers and bestowed on chiefs and dignitaries to convey prestige, respect and power. On social media in New Zealand the striking image went viral, with many people commenting that the picture captured the inversion of traditional gender roles; a female world leader wearing a powerful cloak while pregnant and representing her country. A small and subtle gesture, Theresa May often wears something red when she is in Wales. 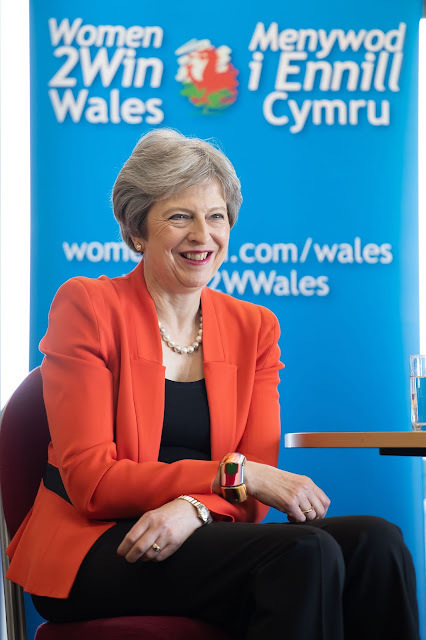 At the launch of Women2Win Wales, May selected her red Amanda Wakeley jacket, teaming it with a pair of red patent kitten heels from favoured brand, L.K. Bennett. It's this type of stylish thought that brings a smile to a fashionista's face! It's hard to believe that this iconic fashion moment was ten years ago. We all waited in anticipation to see if the new First Lady would make a political fashion statement with the choice of her inaugural gown - and she did not disappoint. Obama selected a white silk chiffon off the shoulder gown embellished with organza flowers and Swaorvski crystal embellishments for the round of inaugural balls. Designed by little known designer Jason Wu, the choice conveyed the Obama's message of hope and change- and a fresh start. It's still a classic and can be seen up close in the Smithsonian's Museum of American History. Now, maybe not an immediate or obviously political choice, I did see the parallels in Amber Rudd's black and white piped coat with the uniforms of police officers whilst she was Home Secretary! Plus it's an awfully chic choice to pair with a blouse, trousers and heels. 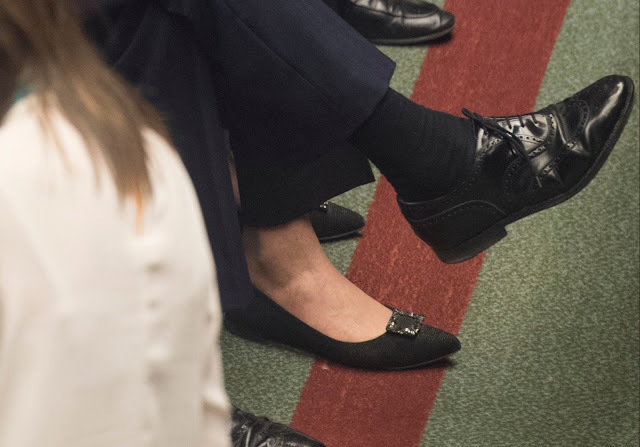 We couldn't cover the Prime Minister without mentioning her shoes. 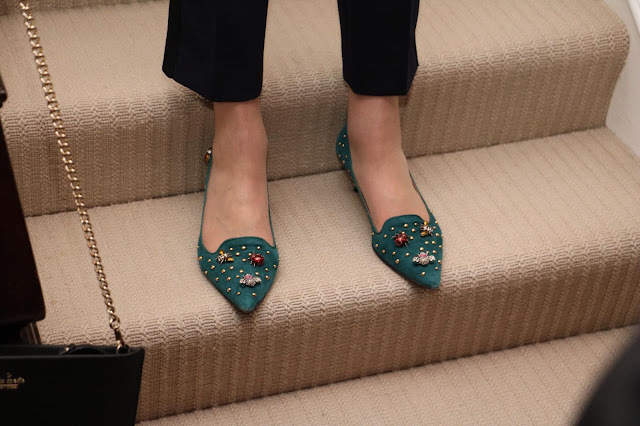 May's choice of Russell & Bromley's Humbug shoes for the 2017 Conservative Party Conference earned little coverage - but eagled eyed Miss Political Style here noticed that they were adorned with sparkling bees. Perhaps it was a subtle nod to the official emblem of the conference's host city, Manchester? Budget Day is truly an exciting one for political geeks like myself, and aside from the fiscal fascination, we couldn't help notice that Liz Truss had selected a rather cool red dress to match the red box of the Chancellor. This particular dress was from Karen Millen - and sold out in rapid time. Much like her tribute to Wales, when visiting Japan in 2017, Theresa May selected a red jersey dress and white blazer to meet her Japanese counterpart. True literal dressing! 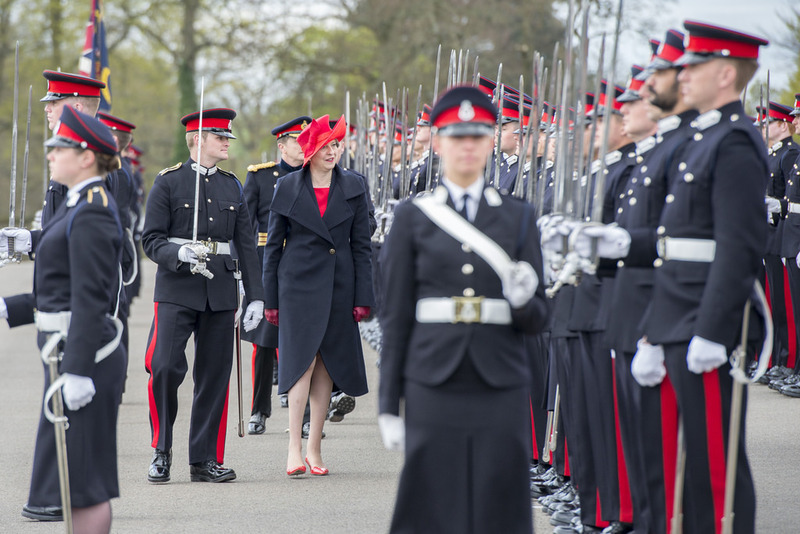 Standing in for the Queen during a passing out parade at Sandhurst in 2017 is perhaps one of Theresa May's most literal message laden fashion moments. From the Military navy coat by Daniel Blake, to the red hat by Liz Felix - this is the ultimate ode to the military uniforms of the cadets. Which of these sartorially savvy looks is your favourite? Let us know in the comments! From two trips to Ireland to a return to Brussels, here's a recap of Theresa May's week. 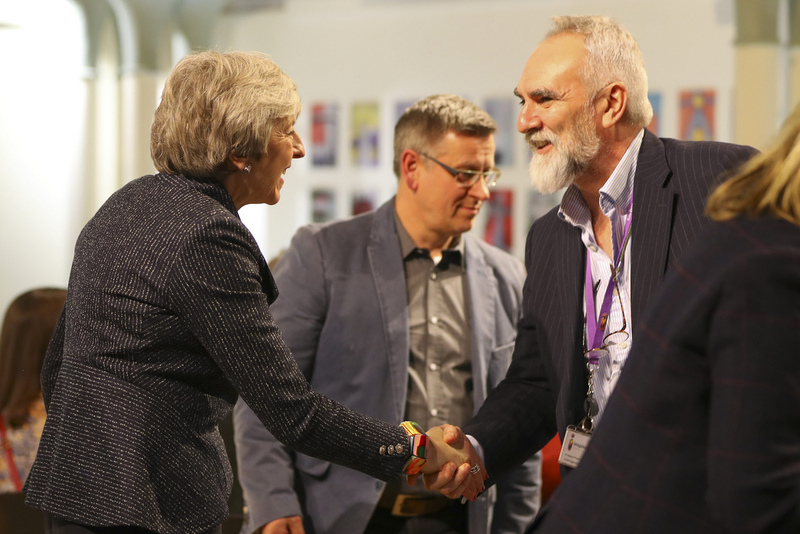 On Tuesday, the PM travelled to Belfast for the first day of her two day trip to the city as part of the ongoing Brexit negotiations. 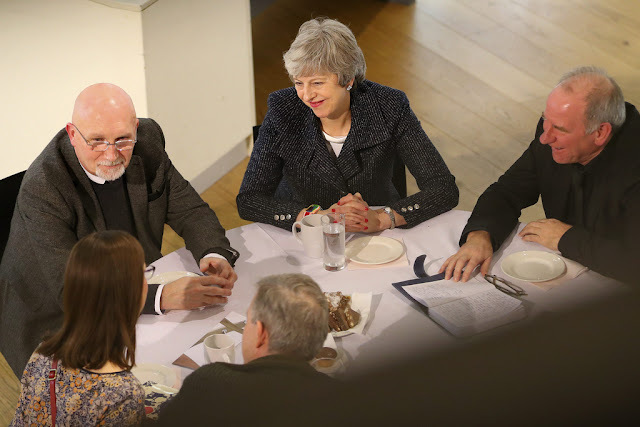 May returned to some fine Daniel Blake tailoring for her visit, wearing the Notch Military jacket in a navy and silver wool, teaming it with a navy skirt and the Twiggy kitten heels from Russell & Bromley. She also kept warm in her Daniel Blake Military coat and a grey cashmere scarf. On Wednesday, the PM had further meetings in Belfast before returning to London for the Black and White Party. May debuted a new Paule Ka dress - an appropriate sleeveless white and black number! She wore the Curve heels from Russell & Bromley and accessorised with some Swarovski jewellery. On Thursday it was back to Brussels- and back to Daniel Blake for May. 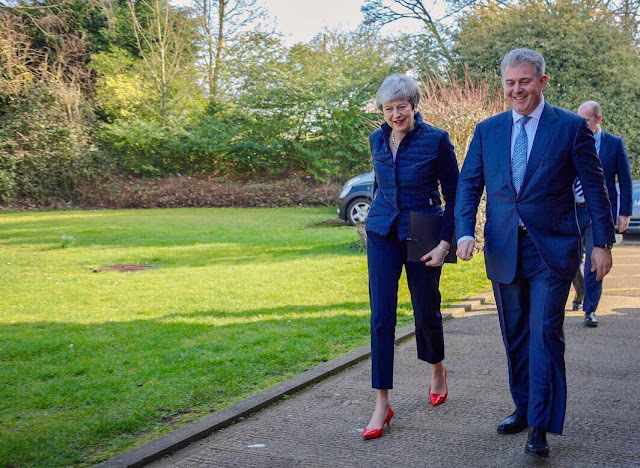 The PM wore our all-time favourite Military jacket from the London based tailor, wearing it with a pair of his custom trousers and the Curve heels. 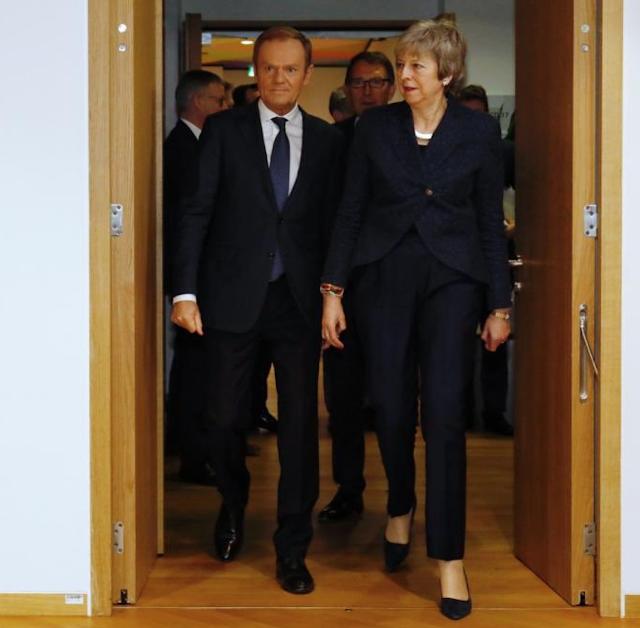 And on Friday, May returned to Dublin for further Brexit talks. Last night saw the snazziest night in the Conservative Party calendar- the Black and White Party. 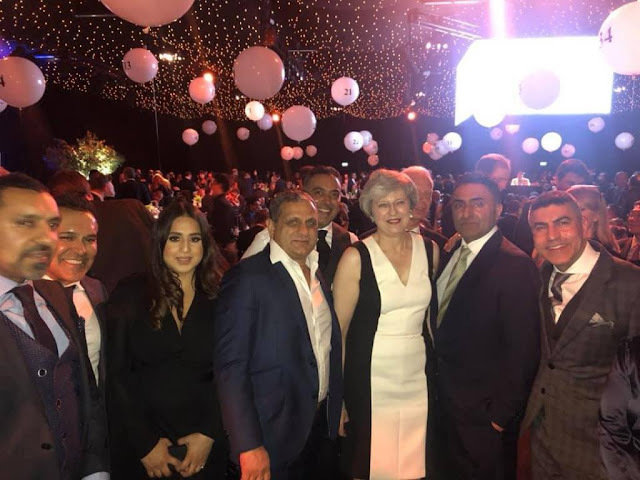 Held at Battersea Evolution, Cabinet ministers joined party supporters for a night of fundraising and fun. The PM attended the event - and wore a new dress for the occasion. Conforming perfectly to the theme, May wore a black and white shift dress from Paule Ka. The sleeveless three-tone dress is made from in wool tricotine stretch, and features a grey panel at the back. May accessorised with her black suede and patent red Curve heels from Russell & Bromley, the silver Valorie clutch from Anya Hindmarch and some oversized sparkly jewellery. A great look! And if you're looking to snag the dress for yourself, it is currently on sale over on the Paule Ka website. 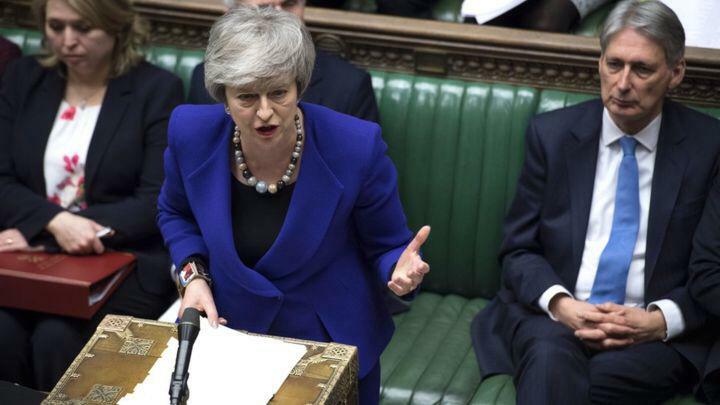 From meetings in Number 10, to Prime Minister's Questions, here's a recap of Theresa May's week. Whilst we didn't see the PM on Monday, we did get a quick snap of her arriving at Number 10. May wore her trusty purple Escada dress, teaming it with the ever elusive black and leopard suede ankle boots and her new Herno coat. 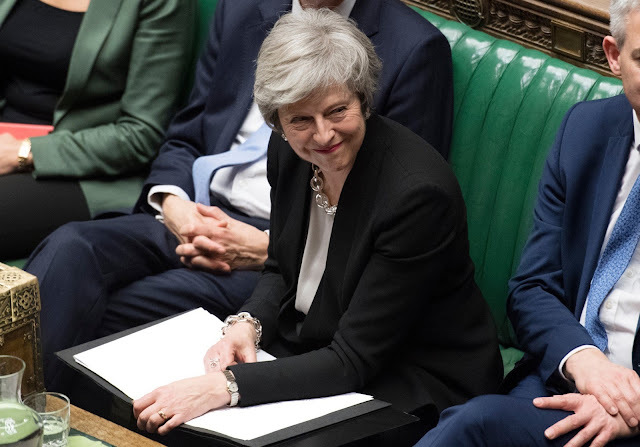 May also attended the 1922 Committee meeting in the evening. 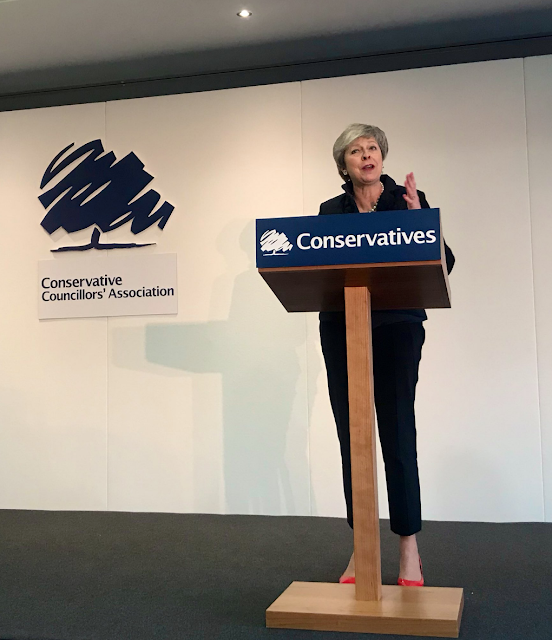 On Tuesday, the PM was in the House updating Members on Brexit. 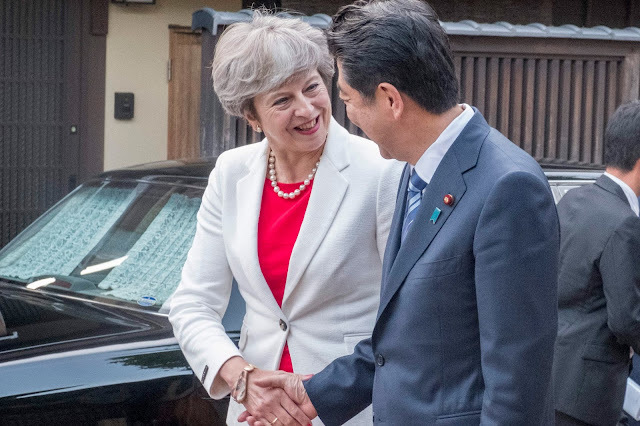 It was a business like look for May - with a great Amanda Wakeley black tailored suit and the oversized chain necklace the PM's pick. And the shoes? The classic black jewelled Divine flats from Russell & Bromley. 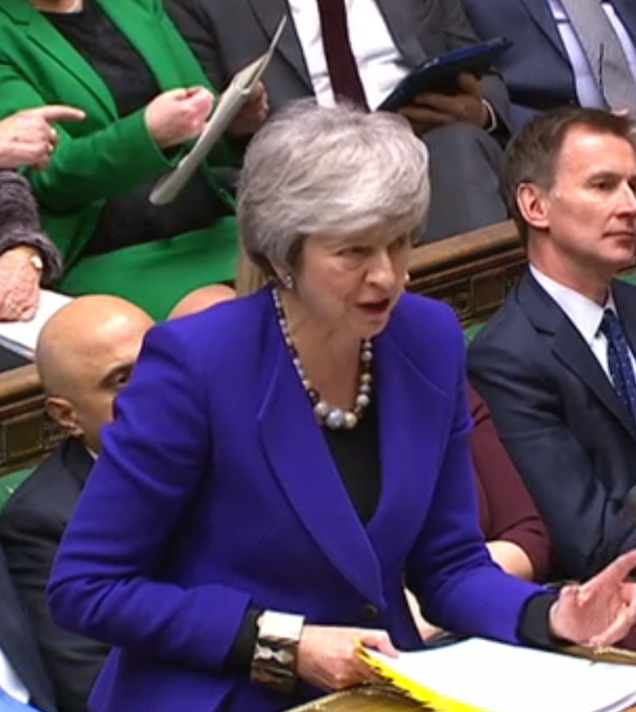 On Wednesday, May was back in the Chamber for Prime Minister's Questions. One of our favourite suits - the purple Origami jacket and matching skirt from Daniel Blake was May's choice. For an added pop of fierce, the PM wore her leopard Charlotte Olympia Kitty heels. In the evening, May attended a private function at the Carlton Club. She selected another Daniel Blake piece, this time the grey Hybrid dress for the event. 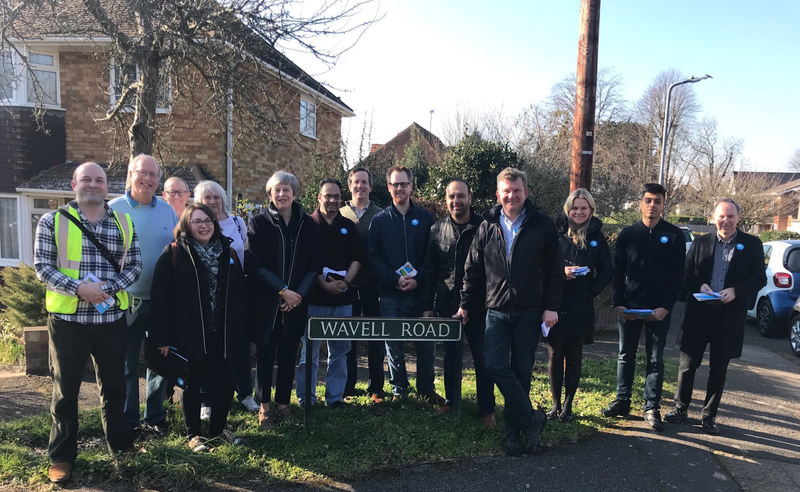 On Friday, the PM was in her Maidenhead constituency. 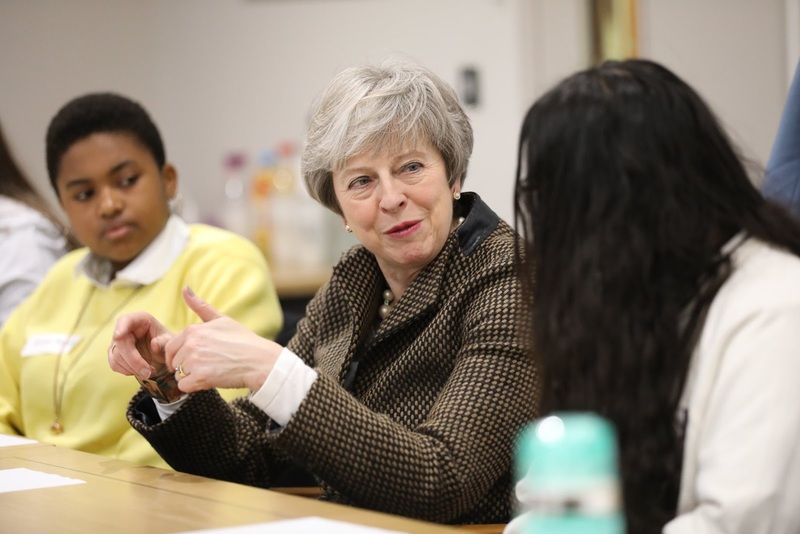 She visited the RBWM Girls' Policy Forum to talk apprenticeships, getting more women into politics, more female role models and overcoming stereotypes. May wore a brown textured jacket with trousers and oversized pearl necklace.